Although being an important language, MapInfo (now PB) interestingly made almost no improvements to the MapBasic Editor. To see that, look at the older versions of MapBasic, say 10 years ago, and unfortunately you will see no improvements for developer convenience or productivity. Therefore, as a developer who is used to utilize and likes great IDEs like Eclipse and Visual Studio (Eclipse is absolutely #1 for me with regard to coding! ), I have decided to write a new editor for MapBasic to boost developer productivity. I made MapBasic IDE inherit and inspire a lot of handy features (form designer, syntax highlighting, code completion, syntax check, code snippets, shortcuts etc.) from Eclipse and Visual Studio. I have written MapBasic IDE using Visual Studio 2010 and C#. 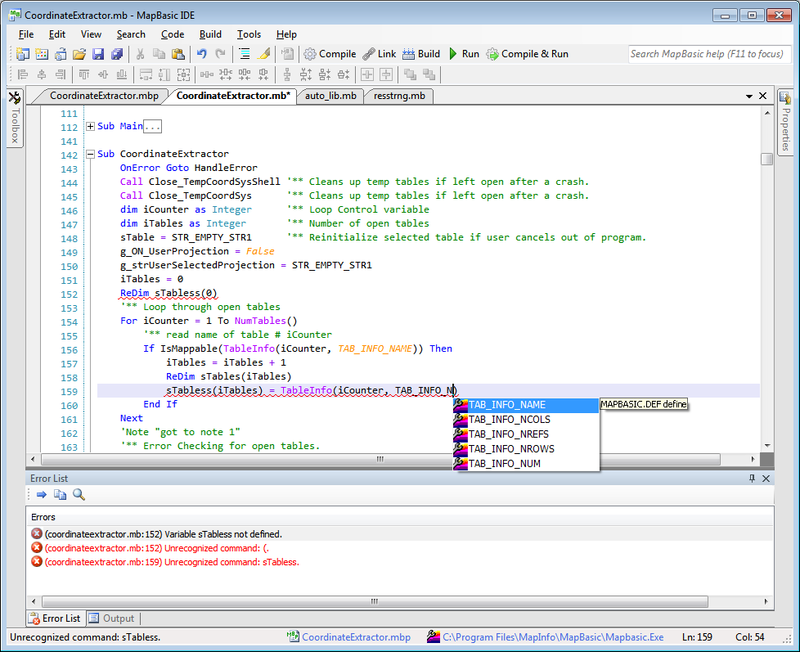 The code editor is SharpDevelop’s text editor component. Output pane to diplay external tool execution and build info. Code editor right click position fixed. After jumping to a line (e.g. to a compilation error) the line is centered vertically. You can create and run your MBX files in folders different from the project (*.mbp) file. Add/Remove MapBasic Installation Path, Custom Code Snippets, New/Edit Custom Code Snippet dialogs made resizable. Close All behavior has been standardized. Shortcut keys of the toolbar buttons are displayed in their tool tips. Project menu renamed to Build. Settings menu renamed to Tools. Goto Declaration context menu of the code editor renamed to Goto Sub/Function Implementation. Error List context menu removed. The same functionality implemented in a toolbar at top of the Error List pane. Space character problem in the project (*.mbp) files fixed. Goto Declaration feature was going to wrong line in some situations. Fixed. Copying a link error in the Error List pane was getting an incomplete error message. Fixed. Please do not hesitate to comment or give any feedbacks. You can enter them in the comment section on the bottom of this page or directly email to me. Of course there may be some bugs in MapBasic IDE, like any other software in the world. If you encounter any problems or bugs, please report them together with error messages and stack traces. You can get the last error message text at the end of the error log file. You can open the log file via Help > Open Error Log menu. You must have MapBasic installed to compile your programs. If you do not have, you can still write programs with MapBasic IDE but you cannot produce MBX files. Use back slashes (\) and relative paths in your project (*.mbp) files. In other words, do not use absolute paths or the “Local: …” syntax. For example, rather than using Application=C:\MB\CODE\CUSTOM.MBX or Application=Local:MapBasic:custom.mbx, use like Application=Bin\MyProject.MBX or Application=..\MyProject.MBX. The same rules apply for your Module=… definitions in the project files. Undo and redo operations in the dialog designer have some issues. For example, some controls may disappear in the designer after you undo or redo. (I have experienced this intermittent issue a few times.) Hence do not rely on these two operations too much. Please save your work frequently while working with the designer. If you encounter a problem, you can revert your work to its last saved state via File > Revert menu. Never close the Toolbox, Properties or Error List windows. If you do so, you will experience some problems. For example, if you close the Properties window, even if you reopen it from the View menu, you cannot display the selected control’s properties while working with the dialog designer. If you, for instance, close the Error List window, Next Error and Previous Error menu items will not function. If you close one of them by mistake, please restart MapBasic IDE. When writing code rather than working with the designer, you naturally might not want to see the Toolbox, Properties or Error List windows, and if this is the case, simply minimize them to the left, right or bottom, respectively. Please do not open files by double clicking or right clicking and selecting Open with > MapBasic IDE. There are some issues with this. (I will fix it.) You can open your projects or documents using the Open Project/Open File menu or buttons, File > Recent Files menu or drag & drop. I rebuilt MapBasic IDE so that it can run with both 32-bit and 64-bit systems. I am able to run it with both 32-bit Windows XP and 64-bit Windows 7. I could not find a chance to test with 64-bit Windows XP. Some people reported that it runs with 64-bit XP. There was a problem with an older version causing a crash upon program exit. Now it appears to be gone but please let me know if you have any issues. You may experience compatibility issues with 64-bit systems and may try switching to Windows XP compatibility mode. You may also experience path access errors and may need to give appropriate permissions or provide other solutions. You can uninstall MapBasic IDE from Control Panel > Add / Remove Programs. 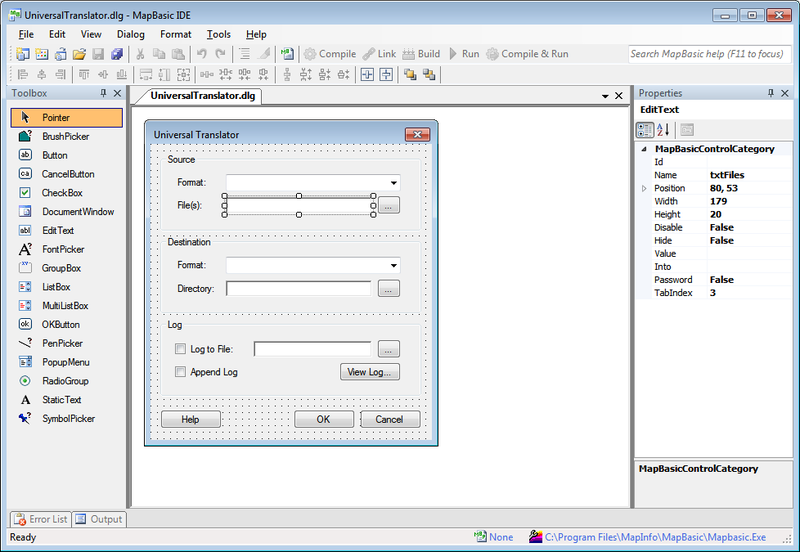 MapBasic IDE’s integrated dialog designer consists of a design surface (dialog form), a toolbox and a properties window much like Visual Studio. The toolbox has all MapBasic controls you will need. To add MapBasic controls to the dialog, simply drag a control from the toolbox and drop it to the dialog. To set a control’s properties, select it on the dialog and edit the values in the properties window. Dialog files are persisted on your disk as XML based files with .dlg extension. Each dialog file contains one and only one dialog. In other words, for each dialog that you will need in your application, you must create a separate dialog file. You can create a new dialog file using the New Item dialog opened with File > New… menu. To generate the MapBasic dialog code, simply use the Generate Dialog Code button on the toolbar. If you click this button for the first time for a particular dialog, MapBasic IDE will generate a new MapBasic file with .mb extension and write the dialog code into this file. For example, when you create and work with a dialog file with name MyDialog.dlg, if you click the Generate Dialog Code button then a new file will be created with name MyDialog.mb. It identifies the start point of the auto-generated dialog code. In other words, all lines under this line will be generated from scratch each time you click the Generate Dialog Code button according to the design you have just made. This means that if you edit these lines (for example add a Calling statement to a button code), then these edits will be overwritten the next time you click the Generate Dialog Code button. Hence, when you need to change a control’s code (again, like adding a Calling statement to a button code), rather than manually editing the .mb file, you must set the buttons Calling property from the designer. When you do so, you do persist the control properties in the right way. Maybe you are asking right now: “OK, but what if I need subs/functions that will be called from the dialog controls? Simply write them above the marker line. MapBasic IDE designer will not overwrite and will preserve the codes above the marker line. After you generate your dialog code as mentioned above, you can copy and paste it to the required location in your main MapBasic file. Or maybe you can make some modifications in the .mb file that the designer generated to be able to include it in other MapBasic files. I leave this point open for the community for better ideas. In later versions, we can improve the designer code generation behavior altogether. There are also a Format menu and a Format toolbar to apply various formatting operations to the controls. For example, you can align the controls, make them equally spaced or same sized, or center them in the dialog. You can preview your dialog by clicking the Compile and Run toolbar button or simply by pressing the F5 key when you are in the code view. If you define the Calling property (in the Properties pane) of a dialog or control, you can go to the calling sub handler in the code easily. For this, simply right click the dialog or control and then click View Code. This is analogous to a Visual Studio feature which brings you to the associated handling procedure in the code when you double-click a form or control. If you have not defined the Handler/Calling property and click View Code, a warning message appears saying that you must set the Handler/Calling property first. At this point you need to exit the tab order setting mode. Click Edit > Tab Order menu again. Now the control order numbers in the dialog are cleared and the Tab Order menu item is unchecked. MapBasic IDE displays different code items with different colors. As can be seen from below, keywords are blue, strings are brown, predefined functions etc. are pink, constants are orange and comments are green. These colors are defined in the *.xshd files located in the <installation directory>\theme folder. If you wish, you can customize the colors by editing these files. You do not have to memorize the constants located in MapBasic.def, Menu.def, PaperSize.def and Icons.def anymore. Code completion feature assists you. Just type the first letters and press Ctrl+Space to display the matching items. To insert the selected item into your code, press Enter or Tab key. Code completion feature not only supports the constants mentioned above, but also MapBasic keywords, predefined subs, functions, commands or expressions. For instance, the item SelectionInfo() shown above is a MapBasic function. The reserved words and predefined MapBasic functions in the completion list belong to MapBasic 12.5. (Many thanks to Egge-Jan Polle for his contribution for more complete and updated item list.) The constants in the four *.DEF files mentioned above are read from your MapBasic installation directory, however. As of MapBasic IDE 1.3, the completion feature has been extended and it includes user-defined sub and function names, types, global, module level and local variable names, and define names. Moreover, the completion covers all items contained in the included files! Also you can see the fields of a custom Type if you type dot (.) just after the type variable name. The other code completion feature is using block shortcuts by pressing the Tab key. If you want to write an If block using the shortcut, just write if and immediately press Tab. MapBasic IDE will automatically insert an if block for you. To be able to use this feature, a MapInfo Pro instance must be running and it must have open tables, of course. When calling a sub or function, if you type an opening parenthesis, i.e. “(“, just after the name of the sub/function, then the method insight feature allows you to see the signature, that is parameters and return type (if function), of the sub/function. To jump to the next error line, click Search > Next Syntax Error menu or press the Ctrl+. keys. To jump to the previous error line, click Search > Previous Syntax Error menu or press the Ctrl+, keys. You can turn on/off this feature using the Toggle Highlight Occurrences button on the toolbar. You can set the highlight occurrences color in the theme files. Assume you have been writing MapBasic code nonstop and like mad, say for 30 minutes, and failed to save your document. Then Murphy Laws are in action and you had a power failure. No problem. MapBasic IDE saves your documents every 2 minutes automatically. This feature excludes the dialog (*.dlg) files. You can do modular programming with MapBasic IDE. In other words, you can create MapBasic project (.mbp) files, link the modules and run the projects within MapBasic IDE. MapBasic IDE is more project-oriented now. When you create or open a project (*.mbp) file then it means you also select the current project. This is exactly the same as using the Project > Select Project File menu from MapBasic. After selecting the current project, all subsequent link and run operations are performed against this project. File menu and toolbar have new items related with projects such as New Project, Open Project and Close Project. There is a difference between Close All and Close Project: Close All simply closes all open documents. You can link or run the current project even when all the documents are closed. Close Project, on the other hand, closes all open documents and the project. Note that when you create or open a project, the name of the project file is displayed in the status bar. If you click this blue link button then the directory of the project file will open in Windows Explorer. Finally! You can build your MapBasic projects with a single click or key (F6). The build process simply finds the module files from the project (*.mbp) file and compiles all the module (*.mb) files which are newer than their compiled (*.mbo) counterparts. It also checks all the include files recursively if there are any newer ones. If all the modules compiles fine then the project is linked also. In other words, the build process creates/updates the target MBX file. Please note that when you set the “Check syntax errors on save” option in the Preferences dialog checked, all the module (*.mb) files will already be compiled every time you save the *.mb files, which means that the *.mb files will not be newer than the compiled *.mbo ones. Hence, if you look at the Output pane after a build, you will see that although you change a module (*.mb) file and save it, this *.mb file will not appear to be compiled in the Output pane. There is also a Rebuild Project menu item under the Build menu, which first cleans, that is, deletes the *.mbx file and all the *.mbo and *.err files, and then builds the project from scratch. If you experience strange behaviors related with the build process, rebuilding the project may solve the issue. You can save time by using smart tags to perform some actions in MapBasic IDE that you would usually handle manually. Smart tags recognize particular compile errors with a Smart Tag Actions icon (the yellow electricity) to make it easy for you to complete some of the most common tasks to fix the compile error. You can click the Smart Tag Actions icon or press Alt+Enter to choose an appropriate action. above) or press Enter while the menu item is selected. Hence you do not have to declare subs or functions when you write them for the first time: Directly write the implementation and use the smart tag, and MapBasic IDE will create the declaration for you. Because of this limited functionality, please feel free to offer new smart tag actions for other compile errors. The Find and Replace dialog has been redesigned. Note that an advanced Find and Replace dialog allowing you to perform project-scoped searches will be implemented in the next version. You can specify the MapBasic compiler, that is version, if you have more than one MapBasic installed on your machine. For example, you may want to compile some of your programs with MapBasic 11.0, while the others with the old MapBasic 7.0. When you run MapBasic IDE for the first time, an info message will appear informing you that you must specify the MapBasic executable that will compile your programs. This dialog has been made resizable. You can easily add or remove items using the buttons with icons on the right. You can also view and change the MapBasic version from the status bar of MapBasic IDE. To change, just click the link, and MapBasic.exe Path dialog will open. You can insert predefined code blocks such as If-Else, For-Next, Do-Case etc. To insert one, press Alt+Insert, select the item from the list and press Enter or Tab. To be able to use this feature, there must be no selected text. Besides the predefined code snippets, you can define your own snippets. This is a very flexible and powerful feature that lets you define whatever code snippets you want. It is especially useful when you define them for frequently used or hard to memorize code segments. It can also reduce your help references. To add a custom code snippet to the cursor location, click the Code > Add Custom Code Snippet… menu or just press Ctrl+Alt+Ins. When the popup list appears, select the snippet and press the Enter or Tab key to insert. Sometimes we want to surround one or more lines of code with blocks like if, for-next etc. Then MapBasic IDE comes into play: To surround a code snippet, select it and then press Ctrl+W. From the popup list, select the block you want and press Enter or Tab. To be able to use this feature, there must be one or more selected lines. To prevent indentation and formatting issues, you must select the entire lines. For that, you can select the line(s) by first putting the cursor on the first column and then pressing Shift+Down Arrow keys. MapBasic IDE allows you to create and execute custom tools to ease your tasks. Once you have created and configured an external tool, you can call this tool from within MapBasic IDE. For instance you can execute batch files or windows programs. MapBasic IDE’s external tools implementation is the same as the Visual Studio one and analogous to the user tools in UltraEdit. Title: Descriptive name of the tool, which will be displayed under the Tools menu. Command: Full path of the executable (Batch file or Windows program). Must be a full absolute path. Arguments: Command line arguments of the command. Initial directory: Working directory for the process associated with the command, if applicable. This is not necessary when you, for example, specified the full path of a document in the Arguments field. Arguments: -server -d "C:\MB Tools\MyTool.mb"
to accept the source and destination file paths as arguments. Note that if you have a directory path with blank characters and getting into trouble, in order not to bang into wall, you may need to enclose the path with quotes like “C:\My Tools”. External tool 'Copy' started at 11:26:42 PM. Execution of the external tool 'Copy' finished successfully at 11:27:01 PM. External tool 'Copy' started at 11:27:10 PM. This error message help you debug the tool. The following arguments are MapBasic IDE variables that are assigned when you launch an external tool. They can be used in the Arguments and Initial directory fields. Document Path $(DocumentPath) Full path of the current document. Document Directory $(DocumentDirectory) Directory path of the current document. Document File Name $(DocumentFileName) File name + extension of the current document. Document File Name Without Extension $(DocumentFileNameWithoutExtension) File name of the current document without extension. Document File Extension $(DocumentFileExtension) Extension of the current document. Document Selection $(DocumentSelection) Selected text of the current document. Project Path $(ProjectPath) Full path of the current project (MBP) file. Project Directory $(ProjectDirectory) Directory path of the current project (MBP) file. Project File Name $(ProjectFileName) File name + extension of the current project (MBP) file. Project Target Path $(ProjectTargetPath) Full MBX file path of the current project. Project Target Directory $(ProjectTargetDirectory) Directory path of the current project’s MBX file. Project Target Name $(ProjectTargetName) File name + extension of the current project’s MBX file. To use the variables, click the arrow buttons near the Arguments and Initial directory fields and then select one of the predefined location menu items to insert the variable into the cursor position in the Arguments or Initial directory fields. Here a variable means a value in the Argument column of the above table, $(DocumentPath) for instance. for the Initial directory field, for example. MapBasic IDE’s Code Editor captures all system Copy and Cut operations. If the cut or copied item contains text then it is stored in memory in the Clipboard Ring. The clipboard recalls the last 15 text items that were cut or copied. This is a powerful feature for quickly copying several pieces of text to a new location or for recalling text that you inadvertently cut. copy into the Clipboard Ring is the current item for pasting. 2) Use Ctrl+Shift+V to paste the Clipboard Ring’s current item to the current document. 3) Repeatedly press Ctrl+Shift+V to cycle through the entries in the Clipboard Ring until you get to the one you want to permanently paste in the document. Each time you press Ctrl+Shift+V, the Editor replaces the last entry you pasted from the Clipboard Ring so that you end up with only the last one you selected. The item you stop on then becomes the current item. 4) Move to another location or cancel the selection. You can use Ctrl+Shift+V to paste the current item again or cycle the Clipboard Ring to a new item. Note that since the implementation of this feature is the same as Visual Studio, I got the above explanation from MSDN. Folding some parts of the code is useful especially in long programs by shortening the display. You can fold (and unfold of course) sub, function and type blocks by clicking the minus (-) icon on the left of them. To unfold, i.e. open, click the plus (+) icon on the left. To fold/unfold all the foldable blocks click the Code > Fold/Unfold menu or press Ctrl+Alt+F keys. For duplicating similar lines or blocks, MapBasic IDE provides a way which is easier than copy-pasting. You can duplicate the current line (the one cursor is on) or selected text. To duplicate, just press Ctrl+D. The log file that stores your critical MapBasic IDE program error information has been moved from the application directory to your <Local Settings>\Application Data\MapBasicIDE folder. Furthermore, you can open and see the logs via Help > Open Error Log menu. You can use this when you want to report (please do so!) the program errors you encounter. You can use drag and drop to open files with MapBasic IDE. You can drag multiple files. If you associate the MapBasic file types with MapBasic IDE, you can open these files with MapBasic IDE by double clicking on them. To delete the current line (the one cursor is on) quickly, click the Code > Delete Current Line menu or press Alt+Del. You can move the current line up or down by using the shortcuts Alt+Up and Alt+Down respectively. No need to cut-paste. You can comment/uncomment a single line or selected lines by Ctrl+7. To quickly navigate to the last edit location in code, press Ctrl+Q. There may be a lot of subs or functions in large MapBasic documents. To cope with those, MapBasic IDE presents a handy feature to access to subs or functions quickly. Just press Ctrl+Shift+O and a list will appear. From the list, select the sub/function to go and press Enter. To cancel, press Esc. Moreover, while you are typing the name of the sub/function, the list will be filtered accordingly. To navigate to he declaration of a sub or function, right click the sub/function name where it is called and click Goto Declaration, or press F3 while the cursor is on the name of the sub/function. Tab width, font and color theme of the editor. Dialog designer grid on/off, plus grid width and height. Turn on/off the syntax check feature. Turn on/off the auto save feature. Turn on/off the highlight occurrences feature. Initial directory that will be displayed in new item and open file dialogs as default. Whether project module files and include files will be opened as well. If you check these two checkboxes, after you have opened a project (.mbp) file, then all module files in the project file and all include files in a MapBasic (.mb) file will also be opened automatically. To open the Preferences dialog, click Tools > Options… menu. To set the type or size of the editor, click the Tools > Options… menu, and then press the Font… link button. This setting is permanent, and will be persisted even when you exit MapBasic IDE. You do not need to deal with MapBasic color codes anymore. To insert a MapBasic color code, click the Edit > Insert Color Code… menu and then select the color you want from the color dialog. Hitting the OK button will insert the MapBasic color code of the selected color into the cursor location. You can also create your custom theme files by copying and modifying the existing ones. You can bookmark the lines you go often and quickly navigate between them. To use bookmarks, use the sub menus under the Code > Bookmarks menu. To zoomin/zoomout the currently open MapBasic document, wheel your mouse forward or backward respectively while pressing the Ctrl key. This is a temporary modification to the document, and it has no effect to other open documents if any. To permanently change the editor font size, refer to the section named “Setting Font Type and Size”. You can dock MapBasic documents vertically or horizontally. Just drag the document header (shown with an ellipsis below) and drop to one of the direction icons that appears while you dragging. Similarly you can dock the documents horizontally. Moreover, you can create both vertical and horizontal combinations provided that there are at least 3 documents. You can directly access to the MapBasic help document within MapBasic IDE. With context sensitive help support, MapBasic IDE assists you to get the help with just one key. For example, assume that you are currently typing the TableInfo() function, and assume you want to look at this function in MapBasic help. Place the cursor on the word TableInfo and press F1. You are on the TableInfo topic in 1 second! In order not to put your hand away from keyboard while coding, MapBasic IDE provides some shortcuts: To focus the MapBasic Help textbox on the upper right, press F11. To focus the code editor, press F12. MapBasic 12.5 new help format is supported. Although this is a development environment, it might be nice to print the code with syntax highlighting, inculre for example in a report. Thanks for developing this amazing application. I’ve been using NotePad++ to write MapBasic code for some years. This has many features which are not available in NotePad++. The one thing which I will miss in your application is the ability to do a “Replace in all Open Documents” function. Sometimes I want to change a variable name and want to replace it in several open modules and the .Def file. It would be really great if your replace dialog had the option to “Replace in All Open Documents” as well as Replace All in the current document. I agree with you for the features you mentioned. They should certainly exist in a modern development environment. They are already in my TODO list. (Renaming all occurences of a variable automatically is part of some procedures called “refactoring” and you can see that this is already included in the “Some Planned Features” section on this page.) In the next version (v1.5) I will probably include these features. Congratulations for the excellent work. Fantastic IDE. You are right, it was a forgotten control. I plan to include DocumentWindow in the next version (v1.5). Thanks. EDIT: DocumentWindow component has been added to the toolbox in MapBasic IDE 1.5. In Dialog properties is missing “calling handler”. The handler is the name of a procedure to call before the user is allowed to use the dialog box. There are a lot of things to do for a better dialog designer and I plan to implement them in v1.5. Please feel free to give any comments or improvement suggestions. Can you give more details about the situation? What do you mean by send to link? BTW…Thanks for a great effort. I will be using IDE from now on. Ahhh…OK Now TAB – Shift TAB is block indenting….not sure why it did not work before. Regardless….great software…Love the dialog editor. Since Tab and Shift Tab is default for block indentation in many IDEs, I didn’t need to mention it in the documentation but I think I’d better mention. It is nice to see a toolbox for dialog box editing but unfortunately I found the toolbox have no components in my machine. Moreover, the “Generate Dialog Code” always remain deactivate. I am not sure whether it is a problem at my machine or others are also facing similar problems. Suggestions to resolute the problem would be highly appreciated. I met the same situation: there is no component inside the toolbox and the ‘Generate Dialog Code’ button is disabled. I will try to reproduce the situation with your environment. Thanks for the feedback. All sorted out now. It seems in my machine, before opening ..\MapBasic IDE\NewDialog.dlg explicitly, the MapBasic IDE was not able to copy/replicate components from NewDialog.dlg to an empty .dlg file. However, once it was happy I was unable to replicate the same issue once again. Thanks for sharing the result. Hello Mustafa and thank you for all your hard work on creating an IDE for MapBasic. I´ve encountered a couple of errors that might relate to Windows 7 64bit since a colleague of mine with Windows XP doesn´t have the same issues. I have checked the “Open project module files also when the project file has been opened” check box, but the MB files related to the project doesn´t open when I open a mbp-file. Furthermore, the CTRL+U claims that the .mbx files couldn´t be found even though I´m able to located it with explorer. Have you considered turning the project into an open-source project? Currently I am hard working for my MSc. thesis and thus have no time to update MapBasic IDE. However I am open to all feature requests and adding them to my wish list. I will certainly inspect your issues later. For Ctrl+K, I am planning an automatic build feature that will achieve what you request. With regard to opening the source, currently I have no plan for that. The biggest problem for me is debugging, and I have found this utility to help with debugging my MapInfo programs: http://www.spatialprojects.com.au/mbtestbench.htm. MBTestBench provides for a “hook” into an editor using arguments. Is it possible to call MapBasic IDE using these arguments which will mean I can use your program and the debugger together? MBTestBench provides a jump to the file and line number in your chosen text editor. Many editors have a command line format to support this. 1) Implementing a full debugger like Visual Studio’s which involves setting break points and inspecting the current variables’ values. But this is really a hard and problematic task since as you know MBX is not an open format and the task may require reverse engineering etc., which may not be legal. 2) Implementing my own debugging tool which dumps, ie writes all of the variable values to a table in a specified execution interval. 3) Integrating MBTestBench with MapBasic IDE. I am aware of this tool but did not use. It looks useful. I don’t know if I am doing something wrong but when i go to compile and run my MB code. The MBX file opens in a notepad window. I like it very much Mustafa and you could make some wonderful improvements and with which I could help since without them it is for me not quite a usable replacement for my customized Notepad++ plus customized batch build commands called from it and based upon http://www.twiav.nl/php/mapbasic.php except that I have added a Build (Compile changed and Link aka make) and Rebuild (ReCompile all and Link) and modified his batch files to work with .MB sources across a sub and super directory hierarchy (yes some of the MapBasic reused from the MapInfo MapBasic Samples is up and across from the current dir). SO the upshot is before building this into the native C# where you can eventually click on a Module=… link or Include … say to open a source file you could add make.exe bash.exe sed.exe touch.exe etc. plus a generic build Makefile with your app to do this Mustafa. I guess when I get a generic make rule processing of the MBP working (as I maybe never bother using a list source files in the makefile itself) I can start using your IDE whilst building from another open cmd window to run my Makefile on the project. I am just about done with a working Makefile (note that GNU Make 3.81 has some bugs/issues under Windows and switching pathing \ to / is such a pain but it is better to use Bash and avoid Cmd scripting). Thank you Mustafa for this great product. I use it to develop some features in MapInfo which our company needs. I was wondering if it is possible to fold/unfold any user defined blok of code. Thanks, S.
Yes, the code editor component (which is SharpDevelop’s code editor) has this capability. I will give it a try to adapt it to MapBasic IDE. Actually I thought to add this useful feature before but did not implement it. Thanks. EDIT: This feature has come with MapBasic IDE 1.5. Ive been having some slight issues with compiling. Project is broken down into roughly 2 MBs that compile to MBO a MBP and several MBs to stay as MBs and a couple of DEFs. When i run the compiler I believe it is trying to compile all of the open TABs in MapBasic.IDE. The end result is it locks up during the compiling (no log record). Release method is to Task manager then kill the semi opened Mapinfow.exes, resulting in a successfully compiled message. Just compiling with only the seperate MBs to MBO and MBP are successful. Note still thoroughly love your work on this Mustafa. Can you tell me the exact steps so that I can reproduce the issue? Note: Compiling process compiles only current document. nice job, it’s a real pleasure to code with this software. I’m an advanced developer in Mapbasic and I think it’s the best! 1 – Method insight – is not working. 1) Was there any exceptions while using method insight? Can you look at the error log using the Help > Open Error Log menu? 2) MapBasic IDE logs all exceptions. Can you send the stack trace of the exception? Exception Description: Index was outside the bounds of the array. 5- toggle ON the button HighLightOcurrence and the exception occurs. To turn back to normal operation, the “user.config” file must be deleted. My environment is Windows 7 Pro, 32 bits, Microsoft Framework 4, Mapinfo 11.0, Mapbasic 10. Now I can reproduce the exception. I will fix it in Beta2. Thanks. so the toolbox was disable. After I renamed the dialog file ,it worked well. It’s very importan and help me so much in my job. Mapbasic IDE 1.5 Beta 1 is really good and worked well, but I have a problem with this version: when I link all my module from the mbp file, its worked well, but I can not run the mbx when I put on the Run button on the Toolbar? So, I think this problem will be fixed in next version. Great program, much better than normal MapBasic, however when I alter a .DEF file, there is no option to compile that .DEF file. Hi, great tool. Seems like this point has been raised, just want to add my voice. My code is modular and using a project file to link all the modules together. The IDE links and creates the .mbx, but it won’t run from within the tool (press the play button etc). You have to go and run the .mbx your self. Ideally, you should make it as easy as in the old mapbasic complier => compile current module => you go that. compile and link => you don’t have that. compile and link and run => you don’t have that. Best if you can do these from keyboard shortcuts too, or at least a button like the play button you have. Can you not make a way to step through code, stop execution, restart etc? Probably not, as you would need to get into MapInfo itself. But man, that would be killer if you could do that, I would pay for that. It works for me. Can you check it again? Thanks for the feedback. I will inspect and try to fix the issue. This happens very often. Is there any chance for UNDO/REDO operations to be fixed ? Thanks for great IDE again. After your previous comment I inspected the issue but unfortunately couldn’t reproduce it. The source of the error is the ICSharpCode.TextEditor component, which is the code editor of MapBasic IDE. It is not my code but since it is open source, I will dive into its details and try to solve the problem. Can you fix the problem? I mean, can you determine exactly when you get this error? Is it totally random? do you have a silent install method of your product ? I ask to you this because we use automatic install with wpkg. In Notepad++ highlight is correct: variable1 and variable2 have different colors from the rest of line. Please feel free to report the trivial issues, too. I will have a look at it. Indeed a very useful development environment that you have created here. – The possibility to set a handler on the dialog itself. These are certainly good improvement suggestions and two of them are already in my – long- wish list. I think I can implement these in v1.6. Please feel free to give any feedbacks. Have a nice Christmas. thank you for your IDE. Do you knoe what’s going on? Thanks for this great tool. But I found whenever I type in “.” period in my mapbasic codes in your tool, it becomes so slow. What is the possible reason for this? Thanks! Thanks for this great tool. But I found whenever I type in period “.” in my mapbasic codes in your tool, it become extreme slow. Any reason for that? Thanks! The reason is that whenever you type a period, MapBasic IDE first investigates whether the word just before the period is a custom Type variable name. If so, auto-completion feature displays the fields (items) of the custom type variable. In MapBasic IDE 1.4 this feature (user defined type member completion upon pressing dot) was not available, so there is no such problem in 1.4. For the time being there is no way to fix the issue but I will inspect and try to fix it in v1.6. 1) Whenever I type “.” in my mapbasic codes in your tool, it become extreme slow. You can write your feedbacks right here. also, when i type “>” in “” program hangs for a while.. Does it occur every time you type the “>” character? Çok başarılı bir çalışma Mustafa Bey, Tebrikler.. Thanks. You are the best. Editor dialog is not possible to precisely position elements on the form (I can only move the elements with the mouse), no binding to the grid. You are right. I have implemented a better dialog designer and removed the warning about the ID uniquness. I will release the v1.6 soon. about compilation .. it was easier to make that project to compile and run regardless of the tab in which we are (you can automatically determine the tab with the project).. So if you want to put a variable as Value, Generate Dialog Code assumes always that it’s a string value so you have to remove manually double quotes in generated *.MB. Its quite annoying ‘bug’. Thanks again. I am using MapBasic IDE every day. MapBasic IDE is very good software. But an undo error occured frequently. Hi. Very helpfull tools. What is your plans about “Project manager”? Actually I want to implement a “project explorer” like Visual Studio solution explorer. But currently I don’t plan a date for it. Both Enter and Tab keys work for me. Can you double-check? Is it possible to fix? hank you. Thanks for the feedback. I will try to fix it. Hello Mustafa. That is my first answer in this forum. First of alI must thanks for all effort which you invest in MI IDE. It is very nice and useful tool. My first wish concern to new version of MI. is PB upgraded MI on version 12.5. Help is no more in CHM file but is driven over QT help assistent. Can we expect fix for this problem. I will look at the issue. Thanks for the info. I have the need to pre-configure MapBasic IDE. Especially the “CurrentMapBasicExePath” in the user.config. Unfortunately it is unpossible to deploy this file to the clients, because the path under %LOCALAPPDATA% seems to contain a random string like “MapBasicIDE.exe_Url_hxp5cj2xxwzpfhlzmw5vcvfytlafg1vu”. Is it possible to change this behaviour, for example to a static path within the userdir or figure out the “random”-part of the path? The long string you mentioned is generated by the .NET framework itself, not by me. Currently I am not aware of a practical solution but I will investigate it. Yes, this may be a good solution for you. I had forgotten that I deploy the MapBasicIDE.exe.config file along with the setup files. Thanks for sharing. You hit the jackpot 🙂 Yes, I am planning to release v1.6 in one or two weeks. You are right about the dialog calling routine. I already implement this feature in MapBasic IDE 1.6, which I will release soon. But StaticText control does not have a “Disable” property in MapBasic. We already have to use Alter Control… in the dialog calling routine. exelente llevo rato con Mb_Coder para desarrollar en MapInfoy se queda muy corto con lo que has hecho aca con este IDE de mi parte todo mi admiracion y desearle muchos exitos gracias por este IDE tan expectacular, exelente trabajo. “Open project modules files..” option works only if modules has relative path in project file, like Module=..\..\..\..\folder\module1.MBO. But if module has absolute path Module=c:\folder\module1.MBO, then module file doesn’t open. > But StaticText control does not have a “Disable” property in MapBasic. We already have to use Alter Control… in the dialog calling routine. I have just tried it and you are certainly right! I was unaware of this undocumented feature. I will definitely integrate it into MapBasic IDE. I can’t imagine how much hardwork must go into putting this together. I only code in mapbasic about once a year for a month straight. and each time i do i go straight back to your website to download your latest IDE. Thanks for the continual updates and improvements. Nice to see that MapBasic developers like and use MapBasic IDE. Thanks. Is there any reason why the size and position values in the dialog editor properties do not match the values used in the generated MapBasic code? I noticed this when I was trying to recreate an existing dialog in the dialog editor, which involved setting the property values by hand rather than relying on the mouse to place the controls on the form. .NET control positions and sizes, on the other hand, are specified in terms of pixels. Thank you for your hard work. Very impressed with your work. Hi Mustafa, great program, thanks for making this. I’ve noticed something which may be me (a user error) or might be intentional. If I open a project file, and place it to the right hand side of the screen, the ‘Project, Link’ menu option is greyed out. However if it’s left as a main window, or put in any other position from the central window selection, the option is available. Is there a difference between a main window, and pushing a window to the side? Yes you are right. It is not intentional, just a small bug. When a document is in the “floating” mode the associated event (something like ActiveChildChanged) does not raise, hence the result. I will try to fix it. Thanks for the feedback. Focus on e.g. Fetch and press F1 and get error no help. Not a big isue as i have Mapbasic help open all the time i work in MapInfo. It feels like it cannot find the help file. You are right. Current MapBasic IDE version does not support the new MapBasic help format. MapBasic v1.7 will support it. I get errors every time using Undo. I’d like to see the ability to customise toolbar commands, so I can add in the ones I use most, like bookmarks. Or just add some of the frequently used buttons to another toolbar. I have worked for the undo issue and hope it will be fixed in v1.7. Customizing toolbar commands would be great but I do not have time for those secondary features. But adding commands like bookmarks to the toolbar in v1.7 can be a workaround. Thanks for the feedback. Exception Description: Value cannot be null. I will inspect it at home and give feedback. Thanks. I looked at this but unfortunately could not reproduce the issue. Can you give more details? If you open a project and click “Build Project” or F6 then the unexpect error occurs. Can you specify the stack trace of the error using the MapBasic IDE log? Thanks. First, excuse me for my English, it’s not my native language. I’m just starting to familiarize with MapBasic IDE, but I already like it. Great job! I hope my feedback will help you to perfect your program further. I’m running MapBasic IDE 1.7 Beta1 on Windows 7 x64. Context sensitive help and “Search MapBasic help” features does not work as intended with MapBasic 8.0. Hlp-file opens but jump to requested topic doesn’t happen. I tried running command “winhlp32.exe -kLeft$ MAPBASIC.HLP” in cmd and it works fine. “Goto sub/function implementation” and “Goto sub/function” makes me wait too long when I use it on big mb-file (~12000 lines) with about 1000 of subroutines (my library of general use subroutines). I suggest some optimization and/or maintaining database of subroutines. Such database might be updated on demand if maintaining it automatically will be too slow. Text search works fast enough so you can store only subroutine names in database. Revert menu command reverts file to last saved state including auto-saved. I don’t see any sense to rollback to auto-saved state. Auto-save happens often and the result of such revert is hardly predictable. Revert to last manually saved state might be useful. “Restore last open project on IDE start” option. “Search from start” option in “Find and replace” dialog. “Match whole word/phrase” option in “Find and replace” dialog. “Indent size” option (4 symbols is too much, I prefer 2). Currently I’m using Multi-Edit 8 as code editor for MapBasic and I like it very much. It’s very customizable and configuration process is easy and convenient. And also ME8 is very fast (1999 year of production, he-he). I like it’s tags system which I use for instant access to any subroutine implementation or declaration (I use explicit tags for that). Templates system is also extremely handy. For convenient compilation, build, run and all other project management functions i wrote my own project manager on Delphi 7, so I do not need to mess with mbp-file contents any more. E-mail me if you need any details. Good luck to you in your job! MapBasic IDE currently does not support searching through the old *.hlp files but I will try to support it in the next version. I am aware the performance issues and will fix them. You are certainly right about the revert issue. I will try to improve it. I am going to add your feature requests to my TODO list. Note: You can already set the indent size from the Preferences dialog. Sorry, I missed “Tab width” option in Preferences. I have another thought. “Add/Remove MapBasic Installation Path” dialog is obsolete in my opinion. I would replace “Edit…” button with “Add…” and “Remove…” buttons in “MapBasic.exe Path” dialog. Or even managed without a dialog, just with popup menu. What to use, menu or dialog is up to you, but the necessity to press “+” button after browsing for mapbasic.exe does not feel right. After browsing for exe, path must be already in the list without any additional steps. Also it would be nice to be able to switch mapbasic help-file version separately from compiler version. Of course all that I mentioned here is not essential, but I hope it will be useful in the future. These are secondary but useful feature suggestions. I will consider to implement these later. Thanks. Checking/unchecking “Show grid” option in Preferences does not affect grid in open dlg-file. It applies only after reopening dlg-file. “Align centers” and “Align middles” tools are confused (must be swapped). “Remove vertical/horizontal spacing” tools does not take into account which control among selected is primary and must stay in place (“Increase/decrease spacing” tools works correctly). Let us assume that editor and dialog designer windows are shown side by side (it’s really convenient). IDE does not notice transition of focus from editor to designer and vice versa if right or middle mouse button was used for that (left mouse button works OK). Also I do not like that Properties window is cleared when dialog designer looses focus. It gets in the way if I need to copy variable or sub name from editor to Properties window. By the way it would be really useful to transfer some control properties to mapbasic code “as is” (without adding double quotes). So it could be possible to use variable name or any other expression as property value. Another bug: “Dialog”/”Generate code…” menu command appended its code to my existing mb-file (because I gave same name to dlg-file :). Mb-file was overwritten without confirmation which isn’t bad, but all Russian (Cyrillic) characters in existing code turned to “?” signs. Russian titles in generated dialog preserved (remained Russian). Undo and revert didn’t help to restore my mb-file so I had to use a backup copy. Maybe IDE should create backup copy of source file on open and then update it on each manual save? And Revert would rollback to this copy. That’s all for now. Continue your great job! The “Show grid” option issue is by design but certainly it will be better to apply the change immediately. I do not have MapBasic IDE right now so I will inspect the other feedback and give my evaluations later. I really need such detailed feedback. Thanks for your time. Hi Mustafa, Thanks for all your hard work on this – it really is a great tool. I have tried 1.7 beta 1 and one thing I have noticed is that when you click on a line in the error list is no longer goes to that line in the code – have you noticed that or is it something to do with my setup? I get an Application Error when using auto completion. for example, write sel then press ctrl + space, write dot (.) in type variable. Exception Description: Illegal characters in path. I will inspect the issue. Thanks. I do not have MapBasic IDE right now so I will inspect the issue and give my comment later. Thanks. Sorry for the late reply. I think this issue is related with the one you entered in 04/March/2016. (Have a look at my comment below.) Since I have fixed the one below, this one should be fixed in the next version too. Thanks. Thanks for new features in version 1.7. I would like to mention, that item discussed by NMItools (11.05.2014) is still active and is very painfull, especialy on big Dialog forms. Sufficiantly sollution will be to leave Vaule enty intact. Yes you are right. I think I missed that comment. I will fix it in the next version. Thanks. Do you accept donations? Because it is a great product. Thanks Uffe but I don’t. I had an incorrectly formatted string in my MB code when I went to save and compile and it crashed the MapBasic IDE. I then tried to open the same source file to correct it and it threw a critical exception about the invalid string and crashed again. I had to open it with MapBasic.exe and correct the source in able to continue using this code with MapBasic IDE. This is an interesting one! I have just fixed it and the fix will be available in the next version. The problem was that the .err file was somehow wrapped at the end of the second line and thus the third line became an invalid error line, hence the runtime error. But as you specified, there is no such problem with MapBasic itself. This new version is even better than the last … thank you! I notice than whenever I type a full stop “.”, even within a comment, the interface hangs for a few seconds. Is it doing anything or is this a bug? This is a known issue actually and I don’t know the exact reason at the moment. I will try to fix it in the next version. Thanks for the feedback. Just had a look at the latest MapBasic documentation from Pitney Bowes. There is some info about the new ribbon interface. Do you have any support for this yet? Thanks by the way for creating a great interface. No, but that would be a good improvement. I will consider to implement it. Thanks. That would be nice for debugger support especially but since MBX is not an open format, that will be illegal I think. Thanks for all your work on this IDE though! It really is very handy! Especially since it has the Dialog creator! After finishing the major features (e.g. full search & replace) I will try to implement it in the next versions. Thanks. Exception Description: Could not find file ‘C:\Users\jwa\Desktop\Risk Priority\Libraries\mbLibrary-master\Enums.def’. Exception Description: Could not find file ‘C:\Users\jwa\Desktop\Risk Priority\Libraries\mbLibrary-master\IMapInfoPro.def’. Exception Description: Cannot access a disposed object. I have created a very large MBFile (355kb). It seems that whenever I type ” ‘. ” in the IDE it instantly crashes… No error logs or anything. It literally just freezes. Any ideas? just a suggestion for a feature I’m sure (or at least I hope) people would find useful. Often when going through other people’s code I’ll find that the indentation, for example with ‘If Then … End If’ statements hasn’t been done correctly, which makes the code hard to read and maintain. If the code between the ‘If Then’ and ‘End If’ is very long, it’s very hard to go over and try to resolve the indentation issues. I thought it would be useful if there was a way to highlight lines of code, then collapse them temporarily (like how you can currently collapse the code between ‘Sub’ ‘End Sub’ (the terminology you use is Fold/Unfold)). That way one could reduce the known If – End If blocks in to 2 lines, so that gradually you could have everything on the same page, which I think would make it easier to visually inspect the indentation of each block. I hope the above is clear, if you think this is a good idea and would like to discuss further please feel free to contact me. Oh and generally MapBasic IDE is very good, I don’t understand why Pitney Bowes don’t promote it as an official IDE, the MapBasic editor itself is absolutely useless! Your program makes developing in MapBasic a lot easier. Hi Alex and sorry for the (very) late reply. You are right with what you mentioned. I think you mean collapsing and expanding the if/else blocks. Some IDEs does support this feature. I will investigate it. Thanks. Mustafa I’m not sure if this is a known fault but I can’t browse to mapped network drives to open files or projects. Windows 10 Pro. I never use MapBasic IDE with Windows 10. What is the problem? What do you mean by saying “I can’t browse to mapped network drives”?